Freshwater Fishing License required when fishing in freshwater. Saltwater Fishing License required when fishing in saltwater. The American shad’s body is blue or green in color along the top of its body with silvery sides. At the upper side of the operculum or gill flap, a dark spot is present which is usually followed by a row of smaller spots along the upper side of the body. Atlantic Ocean, but migrates up freshwater rivers to spawn in the Coastal Plain. (moves farther up than any other Alosa species). Plankton, algae, insects, microscopic crustaceans by swimming with mouths open and allowing water to enter the mouth and cross their gill rakers (function like a strainer catching food). 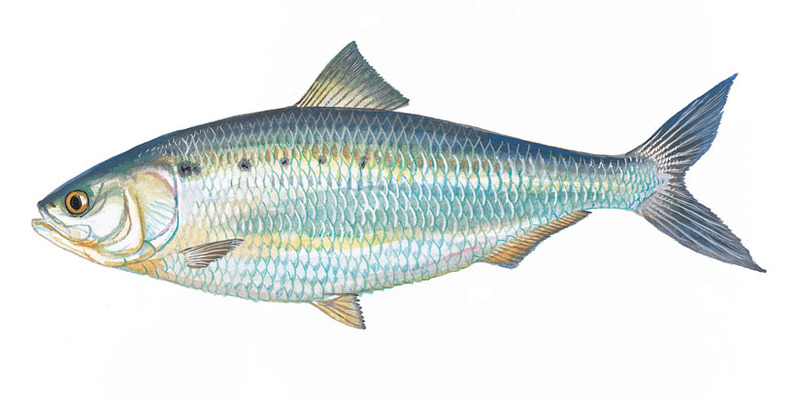 Adult American shad migrate from the Atlantic Ocean into coastal rivers when water temperatures reach 55 degrees Fahrenheit, usually around mid-January to April. Males generally arrive first. Spawning activity occurs in the evening in shallow waters. The eggs are released in batches by the females as they swim hundreds of miles up unimpeded streams. The females will deposit anywhere from 100,000 to 600,000 eggs. The eggs generally sink and are carried by the currents. Once the eggs hatch, young shad will remain to feed and grow in lower rivers and estuarine areas. In the fall, young American shad migrate to the ocean. The American shad is the largest member of the herring family in the United States and is highly valued as a commercial fish for the quality of its meat and roe (eggs). American shad were an important food source to early American colonists and is still use today. Sport fishing opportunities occur on several coastal rivers, particularly the Cooper and Santee. Since American shad are a diadromous fish, meaning they migrate between fresh and salt water, impoundments and dams create big problems for fish trying to migrate. To help the fish travel their natural routes, fish locks were constructed at Pinopolis and the St. Stephen dams to assist shad and other migratory fish species in their spawning migrations. Currently, the St. Stephen fish lock annually passes some of the highest numbers of American shad on the East Coast of the United States. Rohde, Fred C, Arndt, Rudolf G., Foltz, Jeffery W., Quattro, Joseph M. 2009. Freshwater Fishes of South Carolina. University of South Carolina Press, Columbia, South Carolina. Wildlife and Freshwater Fisheries Division. 2009. 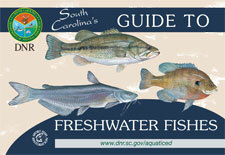 South Carolina Guide to Freshwater Fishes. Fish Illustration by Duane Raver.